Products used to prevent or control ticks include Frontline, Preventic collars, Permoxin Insecticidal Spray and Wash, Advantix and Revolution. Tick prevention should continue throughout the tick season, in conjunction with daily checking of the pet's skin for attached ticks. There is a wide range of products available for tick control. They work in slightly different ways, have different lengths of protection and cover different ticks. The active ingredients commonly used to kill or repel ticks include fipronil, permethrin, amitraz and selamectin. Fipronil is an active ingredient in Merial's Frontline range of products, which acts by interfering with the tick's nervous system. The chemical inhibits the down-regulation of nervous activity by blocking the action of a receptor which is involved with inhibiting nervous stimulation. Without any down-regulation of the nervous system, the tick's nerves fire randomly and the parasite goes into a hyper-excited state, which causes it to spasm then die. Fipronil kills all stages of dog ticks, however, it is not a tick repellent. Fipronil is contained in Frontline Top Spot, Frontline Plus and Frontline Spray. Frontline Top Spot and Frontline Plus are applied to skin at the back of the neck and are carried all over the body in the skin's oil layer within 24 hours. They are deposited in the sebaceous glands in the skin which re-release the product for at least a month. The spray is sprayed all over the body and also is taken up into sebaceous glands, and active for at least a month. 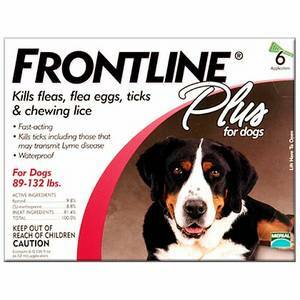 Frontline is registered for the control of all four common ticks in the US for 30 days. However it takes 24 to 48 hours to kill the ticks, with the manufacturer, Merial, advising daily inspection of animals in high-risk tick areas. The 48-hour period it can take to kill the tick may be enough time to transmit some tick-borne diseases. Frontline is also effective against fleas and chewing lice on cats and dogs, and aids in the control of sarcoptic mange in dogs. Frontline Top Spot and Frontline Plus may be used safely in breeding, pregnant and lactating cats and dogs. However the spray makes no such claim. All formulations may be used in puppies and kittens from eight weeks of age. Monthly application is required for adequate tick control. On rare occasions, skin irritation can occur following application. This cause hair loss, redness or itching in the area where the product was applied. On rare occasions, pet owners have also complained of skin reactions, thought to be due to allergic reactions. If animals lick the product, hyper-salivation is likely, due to its bitter taste. Fipronil is extremely toxic to rabbits and should not be used in this species, as it can result in death. Frontline Plus, Frontline Top Spot, Frontline Spray Labels. Merial Ltd, Duluth Ga.
Chin A. et al. Persistent Flea Infestations in Dogs and Cats controlled with monthly topical applications of Fipronil and Methoprene. Aust Vet Practit 35(3) pp 89-96, 2005. Young D.R. Evaluation of Imidacloprid pls Permethrin vs. Fipronil Topical Treatments to repel and Kill American Dog Ticks (Dermacentor variabilis) on Dogs. Suppl Compend Contin Educ Pract Vet. 24:4(B), pp 17-20, 2002. Product label, Preventic. Virbac Corporation, Fort Worth Tx. Product label, K9 Advantix. Bayer Healthcare LLC, Animal Health Division, Shawnee Mission, Ks. U.S. Prescribing Information: Revolution?. Pfizer Animal Health . Advantix? is a registered trademark of Bayer AG, Leverkusen, Germany. Permoxin? is a trademark of Dermcare-Vet Pty Ltd.